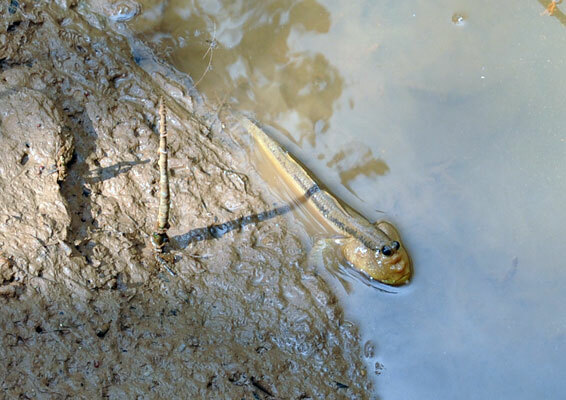 our life in Singapore: The Mudskippers of Berlayer Creek . The Mudskippers of Berlayer Creek . The Berlayer Boardwalk is now open! 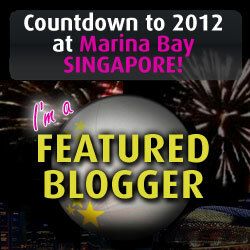 Starting from the Labrador MRT station, the boardwalk leads along the mangroves of the Creek towards the sea. Fellow blogger and friend, Flora and myself decided to explore the new boardwalk today. But we were in for a surprise.....our first experience of seeing walking fish! Amazing little creatures that are actually called Mudskippers. Mudskippers are commonly seen on many of our shores. They are particularly abundant in mangroves and muddy shores, but are also seen on rocky shores and near reefs. In fact they don't really 'walk', but certainly look like they do .... they skip. Hence the name Mudskippers. They curl their muscular body sideways then push against the mud to spring forward. While out of water, they breathe by retaining water in enlarged gill chambers. Just as we bring tanks of air to breathe from when we scuba dive, mudskippers bring stores of water. They can also breathe air through their wet skin. 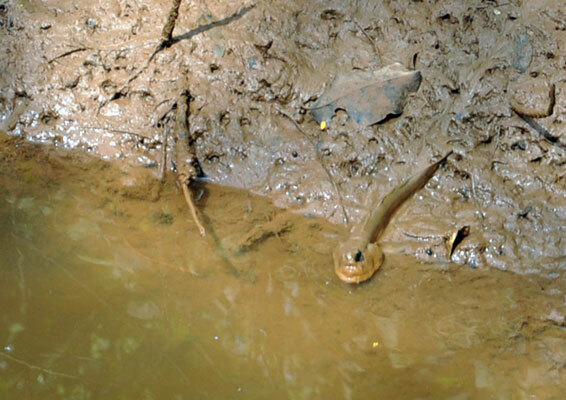 These fish are in fact more comfortable crawling around on the mud than submerged in water! Mudskippers have interesting features designed to rule the mud! They have eyes at the top of the head for an all-round view. While their mouth faces downwards to feed on the mud surface. In some mudskippers, the pelvic fins are fused to form a sucker so they can better cling to rocks and roots. Their pectoral fins are used like crutches to crawl over mud. Some have colourful dorsal fins that can be raised to signal other mudskippers on the sand or mudflats. 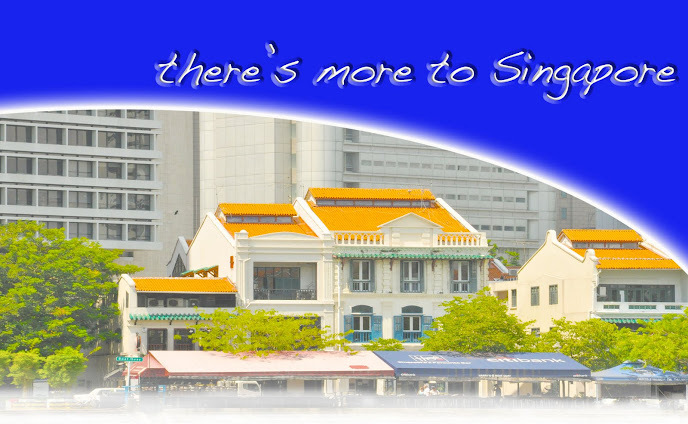 all of the above information on the Mudskippers came from the Wild Shores of Singapores website. Mudskippers! So that's what they're called. Had a good walk yesterday with you. I was tired when I got home!